Welcome to Turner Motorsport Racing. 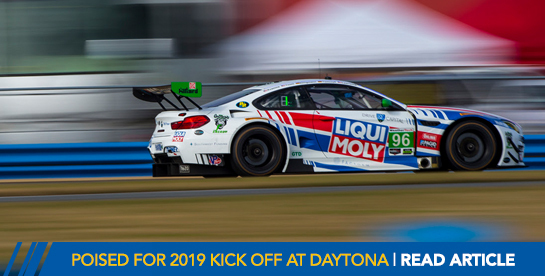 TURNER MOTORSPORT POISED FOR 2019 KICK OFF AT DAYTONA. FLAG TO FLAG TV COVERAGE ALL WEEKEND LONG. CHANGING GEARS, TURNER BMW READY FOR VIR AFTER STRONG WEEKEND IN UTAH. TURNER BMW WITH LESS-THAN-DESIREABLE RESULTS OVER THE BORDER AT CANADIAN TIRE MOTORSPORT PARK. TURNER BMW LOOKS TO CARRY MOMENTUM INTO CANADA. AUBERLEN AND FOLEY TO REJOIN TEAM. STRONG EFFORT BY AUBERLEN AND FOLEY RESULTS IN SEVENTH PLACE FINISH ON STREETS OF DETROIT. ROUND 4 PREVIEW: BILL AUBERLEN RETURNS BEHIND THE WHEEL OF TURNER BMW WITH FRESH FACE ROBBY FOLEY. TURNER BMW WALKS AWAY FROM CAUTION-LESS MID-OHIO WITH SIXTH PLACE FINISH. TURNER BMW FINISHES FOURTEENTH IN RECORD SETTING ROLEX 24 AT DAYTONA. 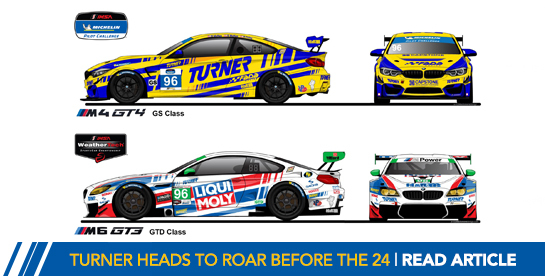 Turner Motorsport to Debut Fresh New LIQUI MOLY Livery for Rolex 24 at Daytona as part of new partnership. TURNER BMW LOOKS TO FINISH 2017 SEASON WITH STRONG RESULTS. DESPITE PERFECT TEAM EXECUTION, TURNER BMW FINISHES FIFTH AT MAZDA RACEWAY LAGUNA SECA. THIRD PLACE TURNER MOTORSPORT LOOKS TO CONTINUE STREAK OF SUCCESS AT LAGUNA SECA. TURNER BMW CAPTURES THIRD PODIUM OF THE SEASON AT VIR. TURNER MOTORSPORT TO TEAM UP WITH BMW OF NORTH AMERICA’s ULTIMATE DRIVING EXPERIENCE FOR ROAD AMERICA AND VIRGINIA INTERNATIONAL RACEWAY. DISSAPOINTMENT AFTER STRONG START AT LIME ROCK PARK FOR NO. 96 TURNER BMW. TURNER MOTORSPORT M6 GT3 PREPARED FOR TEAM’s HOME TRACK SHOWDOWN AT LIME ROCK PARK. TURNER CAPTURES FOURTH STRAIGHT TOP-FIVE AT CANADIAN TIRE MOTORSPORT PARK. TURNER AIMS TO CARRY MOMENTUM INTO CANADIAN TIRE MOTORSPORTS PARK. TURNER BMW TAKES PODIUM IN SAHLENS SIX HOURS AT THE GLEN. MID SEASON REVIEW AS TURNER BMW PREPARES FOR SAHLENS SIX HOURS OF THE GLEN. TEAM SEEKS FUNDED DRIVERS FOR ROAD AMERICA AND VIR. IMPRESSIVE DRIVE BY CURTIS AND KLINGMANN IN MOTOWN FOR SEASON BEST 4TH PLACE FINISH. TURNER BMWS TO MAKE RETURN IN TOURING CAR CLASS AT LIME ROCK PARK. TURNER BMW OF DANE CAMERON CAPTURES TOURING CAR WIN AT LIME ROCK PARK. No. 96 TURNER BMW M6 GT3 “LASSOS” FIFTH PLACE FINISH IN TEXAS. TURNER M6 GT3 HEADS TO CIRCUIT OF THE AMERICAS FOR ROUND FOUR. TROUBLE FOR TURNER BMW M6 GT3 IN LONG BEACH GRAND PRIX DESPITE STRONG PERFORMANCE. TURNER M6 GT3 SET FOR LONG BEACH GRAND PRIX DEBUT. STRONG START FOR TURNER BMW M6 GT3 IN MOBIL1 12 HOURS OF SEBRING. TURNER FINISHES EIGHTH IN EIGHTH START IN ROLEX 24 AT DAYTONA. KICKING OFF 2017 AT DAYTONA - FLAG TO FLAG LIVE COVERAGE. TURNER MOTORSPORT GEARED UP FOR THE 2017 IMSA SEASON - ROLEX 24 AT DAYTONA DRIVER LINEUP CONFIRMED. TURNER MOTORSPORT TAKES 8th IN 2016 BMW SPORT TROPHY. BRET CURTIS NAMED ONE OF THE MOST SUCCESSFUL BMW DRIVERS IN THE WORLD. TURNER MOTORSPORT 2016 SEASON IN REVIEW. TEAM LOOKS TO 2017 WITH FRESH PROGRAMS. TURNER BMW M6 GT3 OF MARSAL, PALTTALA AND LAWRENCE SCORES THIRD PLACE FINISH AT PETIT LE MANS. TURNER BMW M6 GT3 OF CURTIS AND KLINGMANN SCORE SECOND WIN ON SEASON IN TEXAS.